※Check in time after 3 pm. ※Check out time before 10 am. 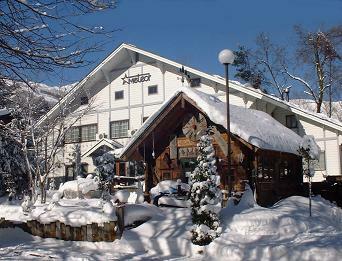 ※There are bars, restaurants and a convenience store within walking distance of the Lodgeｓ. ・1 Japanese style room using common bathrooms and toilets (equipped with towels). ・5 rooms using common bathrooms and toilets (equipped with towels). ・6 rooms with a private bath and toilet. (equipped with towels). １F・・・3 twin rooms and 1triple room. 2F・・・2 twin rooms (plus two beds in loft) and 1triple room (plus two bed in loft). Check in time after 3 pm. Check out time before 10 am. microwave oven, dish washer and all other facilities and utensils usually found in your own kitchen. This new improvement means that those staying in the log hotel will be able to cater for themselves. lodge (maximum : 22 beds + 7 extra beds) for themselves. Ideal for groups of friends and families. ☆Room charge price list of the METEOR Lodge( Pension and Log Hotel) per night. ☆Over 5 years old child is same price of adult. 2,200 yen charge for babies if bed(baby cot) are necessary. These prices mean the Log hotel (Big Log House) will be held exclusively for your group (no other customers). The above is to book the entire lodge for your group. The cost to book the entire Log Hotel (maximum capacity is 22 people + 7 extra sofa beds). Additional utility costs: 11,000 yen per night. Please inquiry the total cost details by email. All 7 rooms with ensuite (each room has a washroom). 2,700 yen charge for babies if bed(baby cot) are necessary. ☆If you need breakfast and dinner, please reserve the day before. Dinner reservation would be required before one day.